Absinthe is the topic of this month's Mixology Monday, hosted by Sonja over at Thinking of rinking. Still settling in on the shelves after a long, undeserved banishment, absinthe is making an exciting comeback in the U.S. 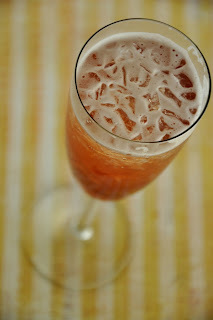 I was going to use the Monkey Gland (gin, orange juice, absinthe, grenadine), but then I had a strange dream that I was in a terrible champagne bar (think Starbucks meets wine bar) in a terrible shopping mall (think two levels and a parking garage plus Belks) ordering a Death in the Afternoon. It's the sort of dream you get after eating strange spicy food and going directly to bed. Not recommended. However, this started a thought process – with which I won't torture you – that resulted in something like “DITA meets a French 75 in a cringe-worthy head-on accident.” Hence the name, An Untimely Death. Tools: Ice crusher (or a mallet and a ziploc), cocktail shaker. Fill a champagne flute (I used an oversized 8 ouncer) about 2/3 full of crushed ice. Shake the absinthe, cherry liqueur, and lemon juice in a cocktail shaker for about 15 seconds. 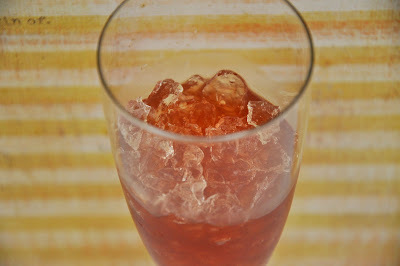 Strain into the crushed ice and top off with chilled sparkling wine.